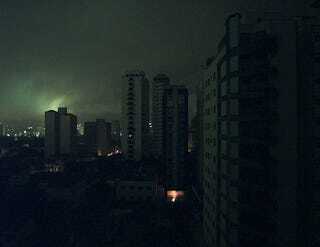 Is Brazil's Mega-Blackout A Harbinger Of Energy Grid Disasters to Come? On Tuesday night, most of the vast country of Brazil was plunged into darkness for several hours when the power grid went down. There is no consensus on what caused it. Was this a model for infrastructure breakdowns to come? Power was returned to some areas that were partially blacked out in as little as 15 minutes. In regions that were completely without electricity - which included Rio de Janeiro, Sao Paulo and Espirito Santo and Mato Grosso do Sul - it took as long as four hours. Tuesday night's power outage took 28,800 megawatts out of the system, plunging several of the country's largest cities into darkness, the ONS said. That was more than 50% of available power generation available on the grid at the time. The power outage affected 18 Brazilian states, starting at 0015 GMT (10:15 p.m. local time). The blackout caused traffic jams, closed metro stations and trapped people in elevators. Power was also briefly cut to Paraguay but was quickly restored. But what's truly interesting is that there is no real explanation for how the grid went down so hard. Bad weather around Itabera, where there is a major transmission station, could have caused it. Some experts claimed lightning strikes caused the blackout, but the country's space agency says the strikes were too far from the transmission station to have affected it. Government representatives say they've closed the book on the case, even though it remains unsolved. A previous blackout in Brazil was blamed on hackers, but turned out to be due to soot in insulators. It's possible that the electrical grid infrastructure degrades in other nations, we can expect massive national blackouts to become the norm.